If you’re transitioning to Current RMS from another solution or spreadsheet-based approach, you might have just called everyone you dealt with “contacts”. In Current, we make a distinction between “contacts” and “organizations”. An “organization” is a company or individual you do business with. A “contact” is a general business contact, or a point of contact at an organization or venue. When would you use an organization? If you intend to bill them, they're an “organization”. Depending on your business, this might include private individuals such as couples getting married or people celebrating a birthday party. Third parties that supply you with kit are also “organizations”. If you'd like to use the sub-rent functionality in Current, add any sub-rent suppliers as organizations. When would you use a contact? A point of contact at an organization or venue is a “contact”. This might be someone that works in the accounts department or the person at the company that you deal with most often. Freelancers and people outside of your company who provide services for you are “contacts”. If you’re using services in Current, external staff should be added as contacts. ⚠️ You cannot set a contact as the entity to bill on an opportunity or invoice. When would you use a venue? If you deliver to an address frequently, add it as a “venue”. You can choose from a list of venues you’ve created when you’re putting together an opportunity. Studios, rooms, or outdoor spaces that you provide are also “venues”. If you’re using services in Current manage space bookings, add your resources as venues. If you’re billing a company but dealing with a particular person at that company, add the company as the organization to the opportunity and the person you’re dealing with as a participant. 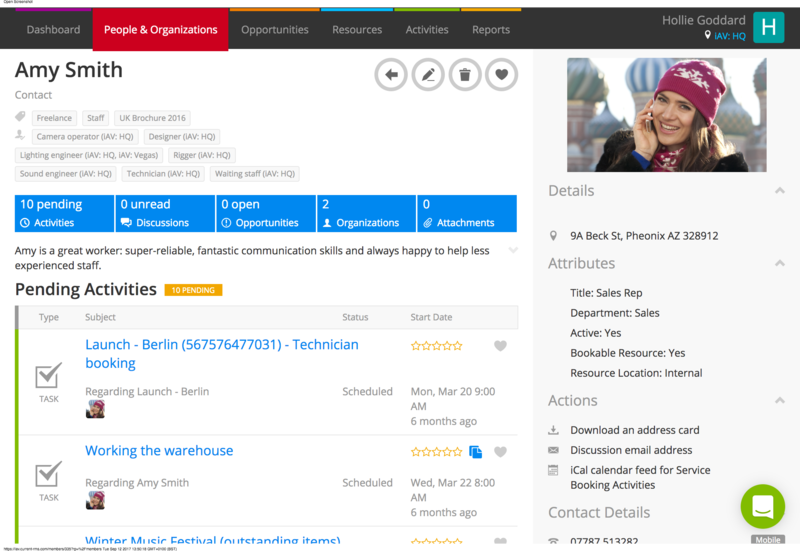 You can see the participant on the opportunity page and the opportunity will show up on the contact’s page in People & Organizations. Do I need to use venues? You don’t. When creating an opportunity, you can choose a delivery address saved on an organization or type in one manually. How do I differentiate between contacts, organizations, and venues? What if an organization is also a venue? Venues and organizations are separate entities in Current RMS right now; there’s no way to set up an organization that’s also a venue. This is something that’s on our customer wishlist if you’d like to vote for it. Can I change the terms?